Matt McAllister holds the world record for wearing 155 t-shirts at the same time. John Dudley holds the record for the most push-ups into a bowl of custard. And Sarah Dakyin holds the record for holding the greatest number of tennis balls while naked. (39, in case you were wondering.) Enter Steve Wiebe. He’s trying to set the world record for Donkey Kong. Well, actually, he’s trying to recapture it. For most of his life, Steve Wiebe was an also-ran. At pivotal moments in his life, be it on a baseball mound, or with playing with his band, when the chips were down, you could count on Steve to not deliver. So, after losing his job, Steve decided that he was going to break the high score record for Donkey Kong. 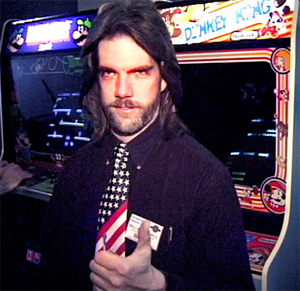 Steve’s big challenger in the Donkey Kong racket is Billy Mitchell, a born winner if there ever was one. Billy lives his life with the mantra that if there’s something worth doing, there’s something worth being the best at. A successful video game player, a successful businessman, Billy seems to have made the transition from video games to other aspects of life in ways that many of the periphery characters in ‘Kong’ haven’t seemed to. Billy is confident, to a point of almost being cocky about his achievements. Steve just wants to be good at something. It is this battle that makes this movie so entertaining. Frankly, I’m a little disappointed that I saw this movie only now. ‘Kong’ is the kind of movie that would play even better with a group of friends or a large theater filled with people. This is clearly one of the best movies of 2007, hands down. Awesome, right? You just totally want to go hang out with Wiebe after watching this movie.